Tours are limited to 50 participants and are available on a first come, first served basis to all registered attendees and their guests. Transportation and lunch are included with the fee. Buses will depart from the Sheraton. Sign up for tours when you register for the Annual Meeting - your confirmation and additional details will be provided at a later date. If you've already registered for the Annual Meeting, click the link in your registration confirmation e-mail and then click "Add Workshops/Tickets." The Rocks & Brews tour has been cancelled. Contact Tana Stellato at [email protected] for further information. This tour will be a true adventure of the senses as you take in the beautiful surroundings of Boulder. First you will travel to the nearby Chautauqua Park area, where a trailhead located just off the main road provides easy access to the beautiful foothills! The City of Boulder began preserving wild lands over 100 years ago and this popular hiking area is a direct result of those efforts. 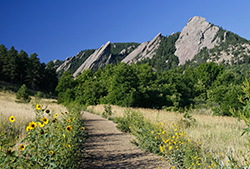 Hikers will enjoy an easy to moderate hike with some great views of the Front Range and the mountains beyond. What a perfect place to commune with nature and take in the outdoors of Colorado, the very heart of who we are! Next you will venture into town to enjoy afternoon tea at The Boulder Dushanbe Tea House. Designed and built by more than 40 artisans in several cities of Tajikistan, Boulder's "sister" country, the Tea House features a hand-carved, hand-painted ceiling as well as ornate, ceramic panels. In addition to a tantalizing dining experience, you may sip the exotic teas for which Dushanbe is known!